If you are a travel freak (enthusiast?) of any level (from ‘hard-core-nomad’ to ‘hey-I-am-just-getting-started-types) you would agree that the very idea of road tripping across a new place makes your heart skip a few beats. It’s because nothing else can beat the excitement of setting out on roads unknown especially when you have amazing people for company! For me, a road trip means being able to feel alive and in charge of my life. Sometimes it’s challenging and sometimes it is a smooth ride but a road trip should be all about drive, stop, admire and repeat for all I know!! I am sure we all have done this at least for once in our life but in case you haven’t done this before a road trip is all you need to make you feel peppy and peart. That way, you get to see various aspects of a country which you wouldn’t know while being stationed at a particular place. This summer (2016) we took another European road trip (in Croatia- the first one being in Spain) and as usual, I can’t keep myself from raving about those immaculate roads and the complimentary sceneries. Overall, Croatia was a wonderful experience as I have mentioned in my previous post and this very special road trip was one of the highlights of our sweet summer getaway. I knew that a road trip through the Dalmatian region is often featured as one of the must-experience-things while visiting Croatia but the journey we did was an unexpected delight. Our TomTom (GPS), in a self-motivated attempt to avoid tolls, took us through lush Croatian forests and pretty little villages. Surely, it did take us more time than expected to reach our destinations but a road trip is supposed to take you off the beaten paths. Besides, we had ample time in hand. Having said that, I remember crossing one deserted looking village and my friend was saying that this could be the haunted village in Croatia people often talk about for most of the houses there looked burnt and deserted!! Luckily, it was daytime and we didn’t come across anything spooky. However, it is advisable to stick to the highways for safety’s sake and to save time. If the GPS asks you to avoid toll roads, try this amazing offline app called Here. This will take you through highways and to the absolutely right destination. I am usually not into travel apps but I recommend this to everyone. Starting from Split, one of the most popular cities in Croatia, we covered Krka National Park, Sibenik (a pretty little town), Plitvice Lakes National Park and Zadar in our three days long trip. And before I go on and on about how pretty the roads were there are few things I want to discuss about doing a road trip in Croatia. 1. The most picturesque route in Croatia is undoubtedly (so I have heard) the Adriatic road (Jadranska magistrala) connecting Rijeka and Dubrovnik. But you can choose any other towns because the motorway system in Croatia doesn’t disappoint. 2. I am assuming that you will be hiring a car in Croatia (we hired one from the Split Airport). In that case, book beforehand to save time especially in the summer months and make sure to check with your car hire company about their policies way before confirming your booking. 3. It’s better to buy a local SIM card in order to call for help in case of trouble or need for any road assistance. Also, the Croatian Auto Club Emergency Service has a telephone helpline number (987) where you can call and ask for help. 4. To know various road rules in Croatia you can download a brochure beforehand and do some self-study. 5. Overtaking on hairpin roads is like a sport for the local people in Croatia but you don’t have to play their game. Just follow the rules. 6. Breath analyzer tests are very common on the roads. Just oblige as refusing to take the test automatically mean that you are driving under the influence of alcohol. 7. If you intend to drive to and from Italy then check the border crossing rules beforehand. 8. Avoid off-roading at night as deserted areas might not be safe even though the crime levels are low and violence on the road is very rare. Also, while off roading just beware of unexploded mines from Croatia’s war days in areas like Plitvice Lakes National Park and some regions in Zadar and other border areas. 9. Book your stopover stays way before you land in Croatia as this is one country which is always crowded. You don’t want to spend the night in your car for sure. 10. We drove in Croatia with our Indian Driving licenses but it is always good to have an international driving license. If not, do some research whether your country DL will be valid for driving in Croatia. Alright, these are my top 10 tips on road tripping in Croatia. I suppose, I don’t need to tell you to empty your bladder and stock up snacks before setting out on the highway as you can stop your car only at those gas stations. Taking other roads is fine as there is no dearth of roadside eateries with pretty decors. But it is always good to take precautions. Hence, repeat after me-empty bladder; full tummy. 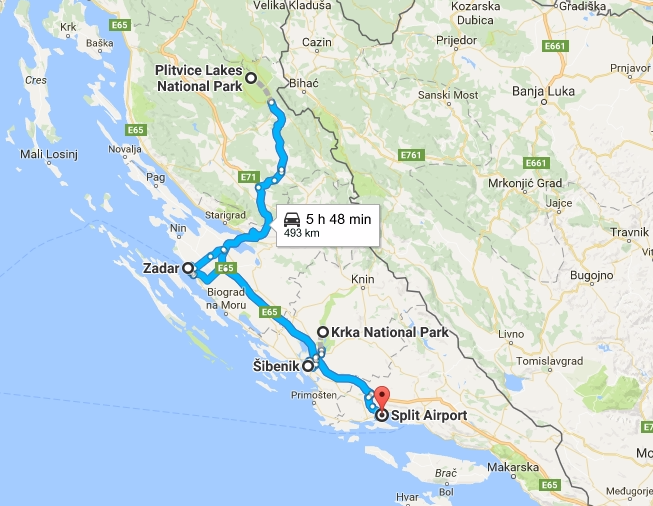 After arriving in Split, we started from the airport itself and went straight to Krka National Park and stayed at Sibenik for the night which was just about 30 km from the park. As always, booking a nice and cozy apartment on Airbnb helped. Next, we went to Plitvice National Park and after doing a bone wrecking 7 hours long hike we stayed at a nearby home-stay for the night. Then on the third day, we went early in the morning to Zadar to see its famous sea-organ and went back straight to Split Airport to return our car. But if you ask me, I would suggest you to skip Krka National Park and go straight to Plitvice as Krka is just the miniature version of the first. Moreover, it is unnervingly crowded and so is Plitvice but at least it is huge enough to accommodate all. Sibenik was worth a halt, though. Regardless of the ifs/buts and dos/don’ts , at the end of the day, it’s your freedom on your own four wheels. So why not make your own itinerary and just set out? Sunny day and a road trip!! Isn’t that a perfect idea?? A blurred one but look at that road stretching as far as your eyes can see! Next time you should take your car on a ferry across to the islands. Did you visit Diocletian’s Palace in Split?